Dieter Tejada wants to diversify the legal profession. Not necessarily by race or by class or by gender. But by an identity he believes is most underrepresented among lawyers today: people who have actually spent time behind bars. In particular, he’s working on creating a bar association specifically for lawyers and aspiring lawyers who have been to prison or have had a loved one serve time behind bars. He’s also worked with New York University’s Prison Reform and Education Project (PREP) to set up a scholarship specifically for “justice-impacted” law school students. The 28-year-old Norwalk native said that the four-and-a-half months he spent in Connecticut prisons at the tail end of his teenage years instilled in him a desire to become a lawyer. Not one who could succeed despite his criminal record. But one who could succeed because of the connection, empathy, and understanding that he believes his own direct experience in prison allows him to have with the men and women he hopes to represent. “I have a duty to use my experience,” he said. Dieter Tejada (center) with WNHH hosts Jeff Grant and Babz Rawls-Ivy. Tejada’s first experience with the criminal justice system came at age 19, when he plead guilty to a first-degree felony assault charge that earned him a five-year sentence suspended after nine months. Tejada was just 17 when he committed the crime to which he ultimately pleaded guilty. After pleading guilty, Tejada spent three months at Bridgeport Correctional Center (BCC), followed by another month-and-a-half at Manson Youth Institution in Cheshire. “I was 115 pounds and terrified,” he remembered about his first night in lock up. He had just finished his first year at UCONN, but would have to take the next semester off. At Manson, he wrote directly to the warden, asking for early release so that he could pursue his dreams of earning a law degree and becoming a mentor to youth who might be on the same path to prison that he had found himself on. He got out after four-and-a-half months, finished his bachelor’s at UCONN, then earned his law degree at Vanderbilt. He passed the bar exam in Connecticut, but is still waiting for the outcome of a requisite character and fitness training before he can be admitted to the state’s bar. In his work with NYU’s PREP and in his experiences returning to prison this time as a law graduate, and not an inmate, Tejada said he has realized just how few lawyers working today truly know what it’s like for their clients who are behind bars. “They don’t know the full extent of how it impacts someone’s life,” he said about most lawyers who work with incarcerated clients. They’ve never worn a belly belt or shackles around their wrists and ankles. So now he’s working to start a bar association for lawyers and aspiring lawyers like himself, people who have had direct personal experience with the criminal justice system. What the National Bar Association has done for African American lawyers historically excluded from the profession, he said, this new organization will do for the justice-impacted. 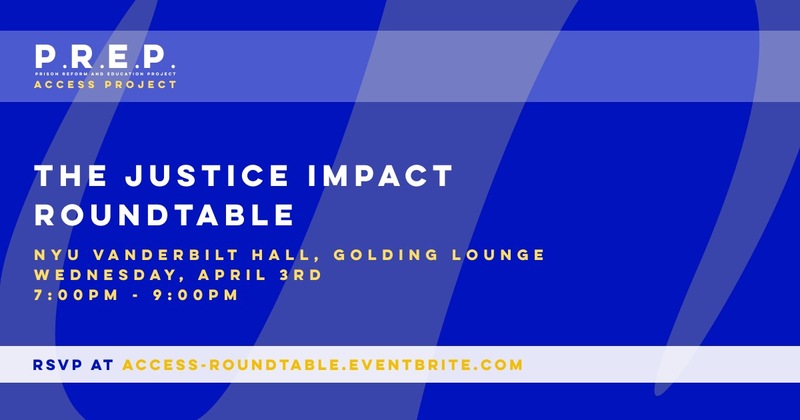 He’s also hosting a justice impact roundtable with 16 other justice-impacted lawyers at NYU on April 3. The meeting will be streamed live on YouTube, he said. And he’s worked with PREP to set up a scholarship that will provide around $5,000 a year for justice-impacted law school students. Careers after Incarceration: a Roundtable Discussion by Formerly incarcerated professionals, students, and attorneys. Free. A roundtable discussion on professional barriers after incarceration with directly impacted students, professionals, and attorneys. In conjunction with its newly launched scholarship, NYU Law’s Prison Reform and Education Project (PREP) is hosting a roundtable discussion for formerly incarcerated attorneys, students, and activists to discuss professional barriers after incarceration. Attendees aim to start a conversation and community that will increase accessibility to the legal profession and support formerly incarcerated professionals. The discussion will cover both concerns for current practicing attorneys as well as advice to those interested in pursuing this path. For more information on the scholarship, and to register (free), click here.